The Schmidt Files. The Adventures of a perfectly normal Australian family. I'm marking time here with this site: much like our actual house, renovations are pending, I have now transferred a heap of old stuff over from where I used to host it, and I think I've got all the old photo album and NZ trip photos finally working. They are a legacy of my beginner forays into web design... done on frontpage... and there is just far too much of it to update, so they'll have to remain in their clunky amateurish state for now. The family profile info is still WAY out of date. One day I'll get round to updating it. The annual 'schmidt files' (in the guise of the dreaded xmas newsletter) give some currency, and, well, they serve a bit as a time capsule for the family archives. 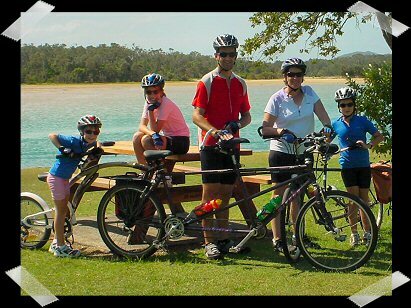 Meanwhile, hop on over to our annual contribution in the name of seasonal greetings, and a summary of a year in the life of one little Aussie family. Well, maybe we're not that average. More than half the people we know think we're a bit crazy becaue of some of the things we choose to do for fun. But I maintain that there are people out there even madder than us. I know there are.. we find their websites! This is merely our contribution to the pool. Welcome to our world .. as I gradually manage to record it all for posterity.